To the best of my knowledge. It cost the going rate of about £35 and I bought it from a stall at an electronics fair about four years ago. So maybe, maybe not. Whatever the case, this software update has destroyed it. Is it the first time the software bricks the programmer? I believe so--certainly I have never had a problem with firmware updates previously. The fact the custom 'tl866' firmware updater no longer works is pretty significant also. Where is the the custom firmware updater? Its the updater that comes with the tools that were mentioned way back at the beginning of this thread. Is it possible with a pickit to program an older bootloader and firmware? Did you flash it from CS to A? The bottom right on the picture shows that they can detect it and brick the programmer. Edit: You can unbrick the device by programming it with the hex generated by the TL866 Firmware Updater via ICSP. I used a PicKit2 programmer and chose 18F_J_ as the device to program. V6.71 is the last known 'safe' version of their software. Edit2: They have just released V6.81 which doesn't brick the TL866, it now only shows a warning screen when you first start the MiniPro program. The screen says that the TL866 is converted from CS to A or it says it's a clone if the DEV-code and serials don't match on a CS. No. Never did anything to it. I always considered it to be (and believe it is) an original unit. After reading radioman's posts I dorced idorced it in boot mode and used the older version of th soth software to reflash it. Sadly I cannot get 'radioman's flasher to work on mine, it just stops at the 'erase' stage and goes no further. The app can then only be exited from taskman/process explorer. I guess I will have to buy a 'PicKit2'... There goes another 10 quid! 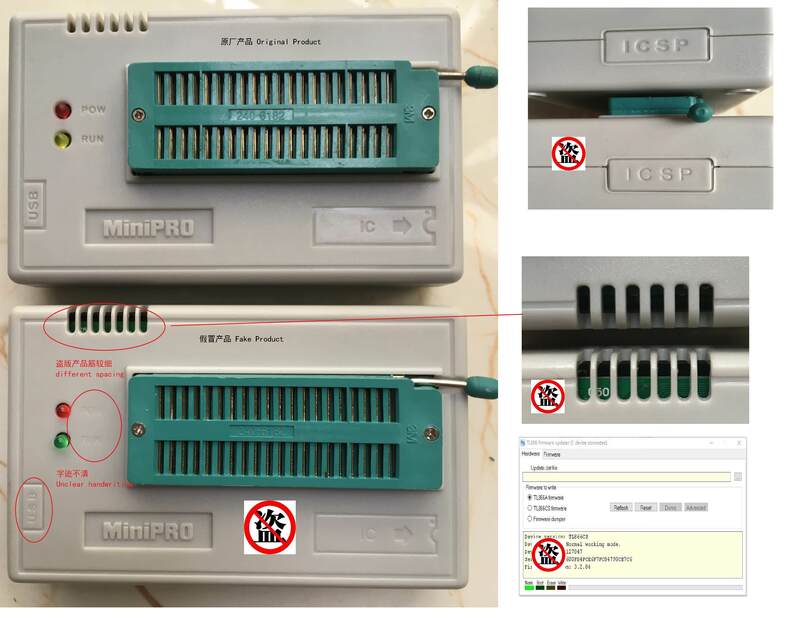 Where exactly are the ICSP connections to do the programming? Is it the same port on the side which the TL866 uses for programming other devices or is there an unpopulated header somewhere on the PCB within the box? Can anyone point me to the 'safe' 6.71 client software for use after I have de-bricked the thing? Do you know if 'Radioman' is still actively writing custom stuff for this device? Is it possible that he will come up with an update to his software that would allow the crippled TL866 to be reprogrammed without external devices like the PicKit? I upgraded my genuine TL866CS with the new V6.81 software without problem. Was there a V6.80 that caused problems or are you guys having problems with V6.81? I can only go from my experience, but v6.80 totally bricked my device. After flashing the client software not only displayed a mystifying 'engrish' popup about piracy and copyright which was annoying but ignorable, but also prevented EEPROM's and likely every other type of chip being flashed by the device. Apparently v6.81 now unbricks the device but keeps the popup... At this stage I am unwilling to update my machine with any more of their software. Annoyingly v6.80 also made some change to the device which in my case at least prevents 'radioman's open-source flasher from working. As things stand I am going to wait for a while to see if he releases a fix for this. Otherwise I will have to get hold of a PicKit2 which will apparently reflash the internal firmware of the TL866 in-circuit. Right now I don't have one though nor can afford £10 for one from eBay either. There is no trace of v6.80 on their site, not in the changelog and also the setup archive was removed. The bricking was only in v6.80, it was deliberate. There is no bricking in v6.81, just a warning if you have a converted TL866, a fake TL866 or a TL866 with a random Dev Code and/or Serial Number. MiniPro v6.81 can't unbrick the device without a hardware modification. To unbrick the TL866 you don't necessarily need a PicKit2. You can *force the TL866 in Bootloader Mode by temporarily soldering a resistor on the PCB, then flashing the firmware in MiniPro (preferably v6.71) and removing the resistor afterwards. Edit: It appears that the firmware flashed by v6.81 also prevents radioman's open-source flasher from working. I guess v6.71 will be the last usable version for us. It sounds like those dudes realised they had severely screwed up and are busy trying to hide the traces! I'll give that resistor dodge a shot--or at least I will once the postman's been on Monday morning... Would you believe I literally just yesterday ran out of decent leaded solder? It all happens at once! In regards the open-source flasher; Radioman says he will give it a look over once he gets back from holiday. So... Fingers crossed he'll be able to get to the bottom of it and sort out the issue. There is a photo on page 5 on how to force boot mode with a resistor. Then someone can use version 6.71 to reflash it. I can understand their desire to thwart counterfeit devices, but bricking them was a really bad idea. I guess they didn't hear about or otherwise learn from FTDI's experience. At least they quickly reversed course on the bricking. Nevertheless, I'm apprehensive to let mine update in the near term despite having a genuine A version. Yup--basically this photograph is all you need to know! Excellent! Nope--at least not in my case. I no longer trust that company in the slightest. 6.71 is known to be good so that is as far up the chain I a going to go. I was thinking of exactly the same thing regards FTDI! To deliberately destroy the customers property is illegal in many countries. You can use 6.81 if you trust that version and don't want to use Radioman's open source flasher afterwards. This was worse than FTDI, v6.80 also bricked genuine TL866s that were converted by their owner after the warranty ran out. I see a different photo on page 5. Attached is the photo that shows where to solder the resistor. It's a resistor of approx. 100-200ohm and goes between +3.3 V and pin 36 (R26) of the controller. Yep, which is one of many reasons such action is a bad idea. One bug and legitimate devices go down. Version 6.81 works with a startup message that says my unit is a converted one. So, someone bought genuine TL866CS units and converted then to TL866A and sold them. Version's 6.81 firmware might work but prevents the open source version for GNU/Linux.